Pavement installation is an excellent option for driveways, patios, parking lots, and much more. 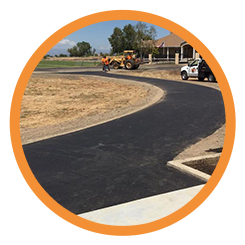 FAIRBANKS PAVING CO. in Oroville, California, provides a range of pavement options for you to choose from. Whether you are installing new pavement or repairing an existing driveway, parking lot, or other paved area, our experienced team can provide the attractive, lasting results you want. From sidewalks to roadway repairs and installation, you can count on us. While we primarily work with asphalt, concrete solutions are available by request. Residential and commercial clients count on us to install their parking lots, driveways, pathways, and more. We provide services for minor repairs or full installations, including dirt moving, preparation, and base rock preparation through installing asphalt. When requested, we also provide sealcoating to protect your investment and striping to properly direct traffic and provide markers for parking. Our team is thorough in all work, paying close attention to the details to provide the best service available. Many of our customers have been coming back to us for many years, as we have been around for four generations, beginning in 1947. Our generations of experience ensure we know what we are doing. Free personalized estimates are available for each job, and your needs are always our top priority.